Welcome to the Print Guidelines. In the following pages I hope you will find all the answers you may have for the Print Competitions. ​Why should I enter the competition? ​The Print Competition is different from the digital competitions as you have to print your photos to get them judged. It is a very different feel to see your photo in your hands rather than just seeing it on the screen. Submitting prints for judging is an excellent learning experience: you will learn from your own submissions as well as from other members. But remember, judges’ judge from their own point of view. Their comments are meant to be help – please take them in that spirit. It’s your choice of how many competition nights you want to enter prints as long as you keep within the rules of the maximum number of prints to enter. If you don’t want to enter some nights, that is your choice, but remember if you are looking to get a trophy, make sure you have the requirements filled by the end of the year. NOTE: Any photo may be only entered once in competition whether it’s for print, pictorial or nature competitions. ​What are the Print Competitions? There are five Regular print competitions per season: two in the fall session, and three in the spring session. For each competition you are allowed a maximum of three prints; they can be any combination of colour (C), monochrome (M) or creative (CR) prints. That means there is a maximum of 15 prints allowed to be submitted per year. Within the rules you cannot submit more than 10 colour or 10 monochrome or 10 creative prints per year, so it would be wise to keep track of your print submissions. The Creative (CR) category is now a stand-alone category as it is in the digital Pictorial division. This competition promotes the manipulation of photograph(s) to create a fictional or conceptual image or “photographic art”. The resulting photograph exhibits an evident use of a person’s imagination to Alter Reality. The change(s) should be evident in some fashion using in-camera or post-processing techniques whether they be in colour, form, shape, or any combination of these three elements. Creative images are often a blend of multiple images or a manipulation of a single image through duplication, etc. The original photographic content of an image should still be identifiable in the final creation but it may also include artwork or computer graphics generated by the photographer. Images that are created totally electronically with no photographic origin are prohibited. Note: Contemporary practice also allows limited use of “selected” portions of a clearly identifiable artwork such as, Michelangelo’s God creating Adam, or a portion of an iconic (meaning universally known) photographic image, to be part of a multilayered creation. This is considered visual quoting. HDR (High Dynamic Range) images without further changes are not considered Altered Reality. Judges score images based on evident creative elements, innovation, quality of execution, the WOW factor, as well as the usual emphasis on composition technique and subject matter. The Montreal Camera Club guidelines incorporate the definitions of “Creative” as found in the Canadian Association for Photographic Art and the Photographic Society of America. ​What are the Theme Competitions? These competitions allow you to challenge yourself to select photos to submit that meet that year’s theme categories. Please note that the Theme categories change each year. There are two Theme print competitions per season: one in each of the fall session, Print #2, and the spring session, Print #4. They take place during the same night as the regular print competition. For these competitions you can submit a maximum of two prints per night. On these nights you can submit a maximum of 3 prints for Regular Print AND a maximum of 2 prints for Theme Print. You do not need to enter both competitions. The theme prints are extra, and do NOT count towards your maximum number of monochrome or colour prints, or the 15 maximum for the year. ​What is the Print of the Year Competition? This is the final competition of the year. The judges will choose a winner in each of the three categories: colour, monochrome and creative from all the accepted prints resubmitted by the members. NOTE: Any theme entries will revert back to the main categories – colour or monochrome; they cannot be considered creative. There are no new print submissions for this competition. You can submit up to a maximum of 10 accepted prints from the previous five competitions of that year. It is your choice if you wish to submit your print(s) to compete. You will need to submit ONLY the titles of the prints you will be entering as well as which competition they were entered in on the Thursday evening by midnight the week before the competition night. I will find your previous entries and compile them. You will then have to bring back those prints as they were when you submitted them initially. ​What is the format to enter my print in competition? 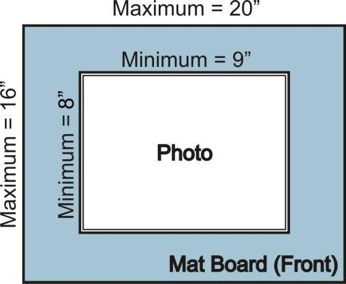 Your prints should be at least 9” on the long side and least 8” on the short side and mounted to a maximum size of 16”x20” (including the mount). Traditional mounting is required which means a matte with a bevel cut, and then placed on top of the print. 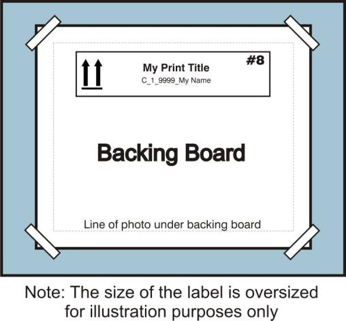 You will also need to put a board on the backside of the mat board, make sure it’s a rigid material, like backing board or something similar, to keep your print safe. TIP: We see a lot of prints that are cropped by the mat board that do not match the digital version submitted. I recently found out that one could add a 1/16” to 1/8” border around the photo to fix this but; you have to make sure the photo is straight in the opening in the mat or it will look off. Where do I print my photograph? There are too many places to list off where you can get your photograph printed. Do your research and make sure they have the experience to get you a quality image to enter into the print competitions. Printing the photograph is just as important and the photograph itself for the Print Competitions. Some members print their photos themselves, while others go to more professional locations. Some use more economical locations such as Costco and Jean Coutu, but bear in mind that each location may not have the same experience level. ​What colour should my mat board be? Matting is an integral part of print presentation and should enhance rather than compete with the picture. Since you are not “framing” the photograph, it’s best to use black or white mat boards for competition. ​The black mat board is most commonly used in the competitions. Note: Many stores that do custom framing will cut mats to order. Another option: Buy our cutter, Logan 380-1, which is available on the internet to make your custom mats. ​How do I mount my Print? 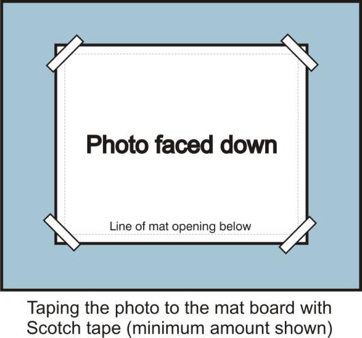 The photo is mounted to the back of the mat board, at least tape the corners on the photo; the backing board is then taped securely to the mat board, covering your photo, so that they don’t fall apart when handling the assembled print. You can use double sided tape but this makes it very difficult if you plan to re-use them for the next competition. I use regular scotch tape and tape the photo down and then the board in the back. NOTE: At the end of the year if you would like to resubmit your prints for Print of the Year; they will need to be in their mat as submitted initially so you may need to invest in few more mat boards during the course of the year. NOTE: If you are using hinged mat boards, please secure the bottom of the mat so it makes it easier for the prints to be handled. If you have any questions about mounting your prints, please reach out to the chair at MCCPrint@gmail.com and we can make sure you get the help that you need. ​The backing board can be anything you want. I use Bristol board, other members use other materials. The important part is that they don’t fall off and that they protect your photo. I find it easier to have a smaller backing board so it is easier to tape it to the back of the mat board. On the backing board you can write anything you would like, but make sure you have the label that will be sent to you on it. Just print and cut it out from the email you receive confirming your entries into that week’s competition. Your label MUST be taped to the back of your print, NO EXCEPTIONS. NOTE: Please pay attention to the arrows to state which way is up for your print as this will determine the positioning of your print in front of the judges. How do I name my print? Using the format below will give us all the information about you as well as the information about the print you are submitting. You will need to submit the digital image of each print you plan to submit into competition. Please make sure that your filename matches the format as indicated as above else you will be requested to resubmit the image. These images must be received by email to MCCPrint@gmail.com for each competition on the Thursday evening by midnight the week before the competition night. The digital image you submit will be projected on the screen for the audience to see. Make sure the image you send is cropped as close as you can to your printed version. Images should be submitted with a maximum width of 3840 pixels and a maximum height of 2160 pixels. Not adhering to the guidelines of size and colour space may negatively impact quality when projected. 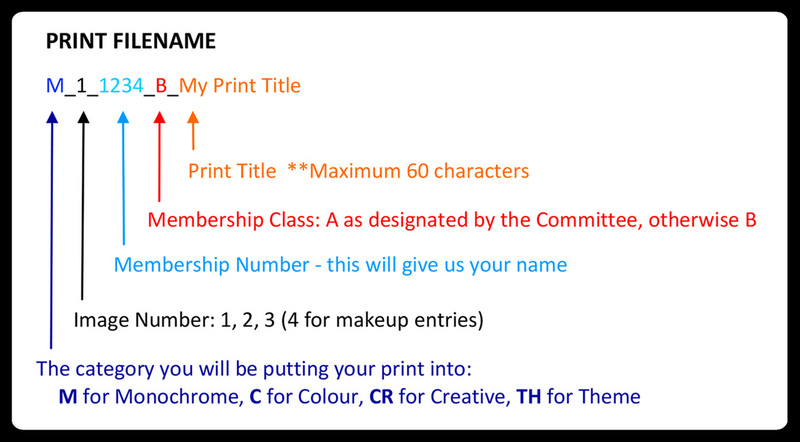 Images must be correctly titled – see “File Naming Rules” on the website under the"Membership – Competitions" tab. Once the print title is submitted, there will be no changing of category the day of the competition. Please make sure your prints are properly put together so they don’t fall apart upon handling. Before competition night, you will receive an email with a pdf file with your labels. These labels have the order number so that the prints will be placed in a random order when being judged. Each print on competition night must have the label received taped to the back; as seen here in the example. ​What time do I need to bring my prints for competition? We highly recommend your prints arrive before 7pm so that the volunteers can get them ready for the judging. Any prints arriving after 7pm MAY be disqualified. However, you will be given a single “delay” access allowing you to be able to submit these into the upcoming competition as they were previously submitted – no changes to the images allowed. ​How does the Competition night work? There will be separate judging with the three judges in another location in the church while the membership at large will be occupied with another activity, like an educational “Tips & Tricks” or with a presenter as an example. After the coffee break, the winners will be announced and the ribbons will be given out. The prints will be showcased on the light box for the judges and on the screen for the members. At this point we will then hear the judges’ comments on the prints. How is my print judged? A judge will expect good technique consisting of correct exposure, ideal depth of field, effective use of color and lighting, and an appropriate background. One expects a level horizon line and cropping so the image shows to its best advantage. In addition to the subject matter, the judges will evaluate the quality, color tone and technical details of printing (or the range of tones in black & white images). Members who are unable to enter their work on a given competition night due to their serving as a judge on that night, are permitted to enter their quota of photographs on other competition nights. Are there trophies for the Print Competitions?